Well, these are a little late, but it doesn't look like any higher quality images are going to surface any time soon, so these will have to make do. These are the top 10 aquascapes in this year's ADA International Aquatic Plants Layout Contest. The "miniature forest" theme has really taken off in popularity with two different iterations in the top 10 this year. I personally like them a lot with position 5 being my personal favorite. What's yours? Wow. Number 1 was like an ancient forest, hard to believe it is all in an aquarium! Some of those aquatic plant layouts are straight out of the yet-to-be-released Avatar 2 movie. 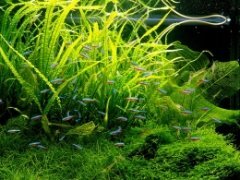 All these freshwater aquarium plants looked totally amazing! I never thought having planted aquariums can be this fun! I would just like to add to my previous comment that these tank arrangements may seem impossible to do when setting up tropical fish tank, yet our own versions can also be followed. It takes a lot of creativity to pull this one off! Wow!! what a nice pics of nature, Wonderful post and i am very thankful to share such kind of pics.